In each edition of Unpacked, we’ll bust a box or case of cards and show you what’s inside. It may be a brand new product. It may be an old product . Either way, we’ll rip open those packs and post the results! Watch the most recent edition of Unpacked below! Configuration: 2 autographs, 4 memorabilia cards, 2 base cards, 1 mini, and 1 bonus hit or insert per box; 12 boxes per case. Hits Expected: At least 72, but up to 84. View the gallery to see what we pulled in this box! 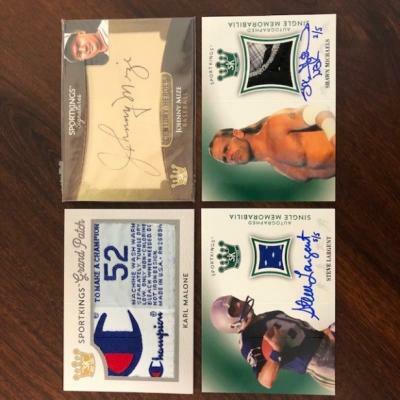 Shop 2018 Sportkings Volume 1!Follow Steel City Collectibles on Twitter @scctradingcards, on Instagram @scctradingcards, & like us on Facebook!Did you know that we have our own logo apparel and accessories? Show your support for the Steel City Scoop by visiting our shop!Don’t forget to listen to the Steel City Scoop podcast! On each episode we give listeners the Inside Scoop on industry news and product releases while also speaking with experts and representatives from all corners of the hobby!See more industry news here!